The much-awaited Comptroller and Auditor General (CAG) report on the acquisition process of 36 fighter jets on Wednesday said the NDA Government’s Rafale deal was 2.86 per cent cheaper than the UPA’s offer in 2007, but the Government made major concessions to the French vendor by including unwarranted India-specific enhancements that led to price escalation. The report said that as per the deal signed by the NDA regime, the delivery of the aircraft would be faster by just one month compared to the UPA schedules. While the CAG report contradicted the claims made by several Government Ministers that the current price of Rafale jets in fly-away condition was nine per cent cheaper than the UPA’s deal, it said the price of the 36 fighter jets was 17.08 per cent cheaper after equipping it with India-specific enhancements under the new deal. The report tabled in Parliament noted that the Government overruled the IAF suggestion to postpone six enhancements till more Rafale aircraft were procured in future. The IAF proposal was not accepted by the Defence Ministry which said this would tantamount to dilution of Air Staff Qualitative Requirements (ASQRs). The Ministry said this was also not in consonance with the basic framework provided by the Joint Statement of April 10, 2015 by the Defence Acquisition Council that aircraft must have same configuration. Moreover, during negotiation of 36 aircraft in 2015, in view of the huge cost escalation and the reduced number of aircraft to be purchased, the Indian negotiation team headed by the Deputy Chief of Air Staff proposed to reduce the number of India-specific enhancements. But the Dassault Aviation, manufacturer of Rafale jets, stated since its price was a total package the Defence Ministry would have to take up the matter with the French Government. The Defence Ministry, while rejecting the IAF suggestion, said reduction of India-specific enhancements was not considered after due deliberation as it was a temporary deferment only for cost reduction measure. The CAG noted that four of these enhancements were stated to be not required in the technical and staff evaluations. The cost of these four enhancements constituted about 14 per cent of the India-specific enhancements contracted cost. The Ministry stated that “scaling down the requirement to limit cash outgo cannot be considered as saving,” the CAG report said. 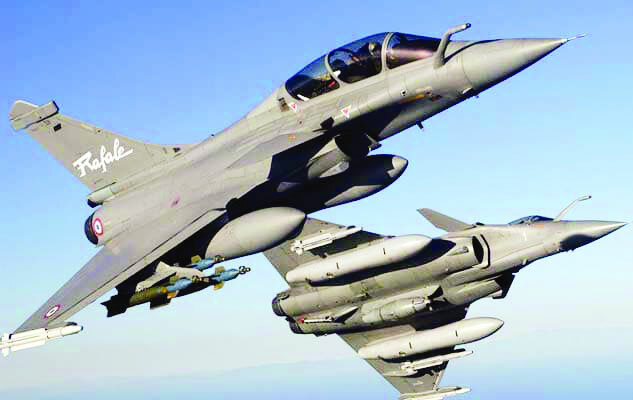 The Rafale deal was inked in 2016 after Prime Minister Narendra Modi and then French President Minister Francois Hollande in a joint statement on April 10, 2015 announced an inter-governmental agreement (IGA) to procure 36 jets from France in fly-away condition. The NDA Government went in for the IGA after scrapping the nearly decade long negotiations under the UPA regime for procuring 126 medium multi-role aircraft (MMRCA) often termed as mother of all deals then. Rafale, manufactured by Dassault Aviation of France, emerged as the lowest bidder but differences over various issues delayed the final inking of the deal. The MMRCA envisaged buying 18 jets in fly-away condition and the remaining to be manufactured by the public sector aviation giant Hindustan Aeronautics Limited (HAL) under a transfer of technology pact. The overall deal at that time was pegged about Rs 45,000 crores. While the Congress has all along alleged wrongdoings in the Rafale deal claiming that the NDA Government bought the each aircraft at a huge cost of Rs 1,600 crore as against the UPA offer of Rs 560 crore. However, the Government in Parliament two years back said the cost of each aircraft without weapons was Rs 670 crores. In the backdrop of the NDA Government justifying outright purchase of 36 Rafales urgently to meet the operational requirements of the IAF due to its depleting squadron strength, the CAG noted as per the Dassault offer in UPA regime for supplying 18 jets off the shelf covered delivery schedule between 37 months to 50 months from the signing of the contract. The next 18 aircraft, which were to be manufactured by the HAL were to be delivered from 49th to 72 months. However, the CAG noted as against the delivery period of 72 months in the earlier offer, the contracted delivery schedule for the latest deal was 71 months, thus an improvement of one month. The report also mentioned that the Indian negotiating team had asked the French side for a delivery schedule of first batch of 18 jets in 24 months and the next batch of 18 in 36 months. However, the French offered 18 jets by 36 to 53 months and remaining 18 aircraft to be delivered in 67 months. This was better than the delivery schedule of 2007 by five months. The Indian negotiation team had apprehensions about this delivery schedule of 71 months because at the time of signing the contract the Dassault had an order backlog of 83 aircraft. Considering its production rate of 11 aircraft a year, clearing this backlog itself would take more than seven years. The Defence Ministry in its response to the CAG said the project was currently on schedule and the progress was being closely monitored by the resident project management team and also through the inter Governmental bilateral high level group. As per the IGA, the first aircraft will be delivered to India in October this year while the last one will be handed over in October 2022. Meanwhile, the CAG in its report said in terms of engineering support package and performance-based logistics, the deal was 6.54 per cent expensive. The report did not include controversial issue of pricing as the Defence Ministry maintained that price could not be revealed due to security concerns and therefore the pricing part was redacted from the CAG report. The report said it examined 11 contracts pertaining to the IAF signed between 2012-13 and 2017-2018 with a total value of Rs 95,000 crores. These included Rafale, Apache attack helicopters, Chinook heavy lift helicopters, PC-7 basic trainer aircraft, pods, missiles, additional C-130 J aircraft, ammunition and associated equipment, reconnaissance systems, full mission simulator for SU-30 and Doppler weather radar.